"Spread the word! Little Melba Doretta Liston was something special." The first line of this picture book biography announces to readers that they are about to meet an amazing individual. Melba Liston was greatly influenced by jazz music she heard as a child growing up in Kansas City in the 1920s. When her mother bought her a trombone, Melba was hooked. She taught herself to play the trombone relying on her "keen ears" later joining the Melodic Dots, a music club at her high school in Los Angeles in the 1940s. Katheryn Russell-Brown's engaging narrative style incorporates the sounds of jazz music. Readers will enjoy following Liston's rise from a young girl who loved listening to music to a renowned jazz musician composing, arranging and performing across the country. The author writes about the racism and sexism Liston faced in way that young readers will understand. "Still, Melba was lonely. She was the only woman in the band. Some of the men were cruel. Others acted as if she wasn't there. Melba let the music in her head keep her company." Morrison's curved, earth-toned illustrations capture the feeling of the music as well as Liston's strength and determination. The final two-page spread of the story is beautiful. Liston performs on stage, alone, playing her trombone to a sold out audience. 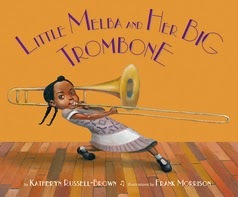 Little Melba and her Big Trombone would make an excellent read aloud for a range of ages. Be sure to play Liston's music for readers. An afterword provides readers with more details about Liston's life and music. Additional back matter includes a discography and list of sources. Pair Little Melba and Her Big Trombone with Jazz Age Josephine by Jonah Winter, When Marian Sang by Pam Munoz Ryan, and Duke Ellington by Andrea Davis Pinkney. Visit the Lee & Low blog to see a playlist of jazz tunes recommended by Frank Morrison. Watch Melba Liston perform with the Quincy Jones Band in 1960.